Isabelle is a relatively ‘new blogger’ that blew my mind away with her contest creations. Today she’s blogging a Lotta dress sewn with knits! 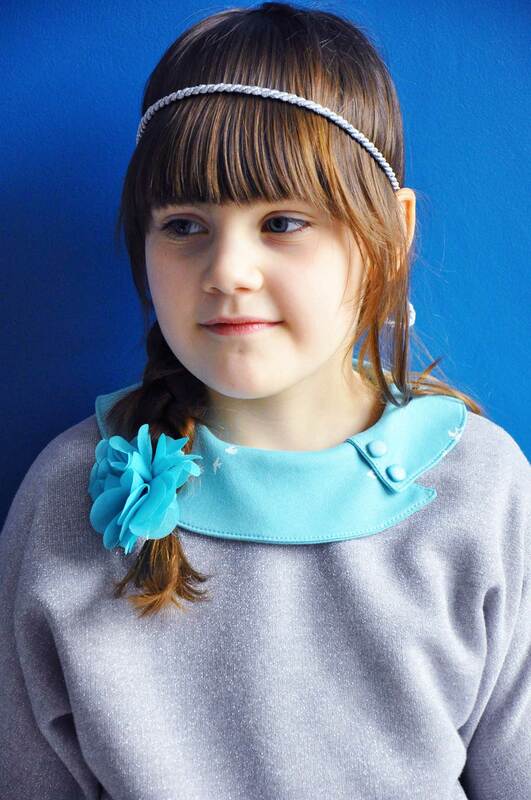 She designed a new collar and afterwards I drew this collar in all sizes for you! 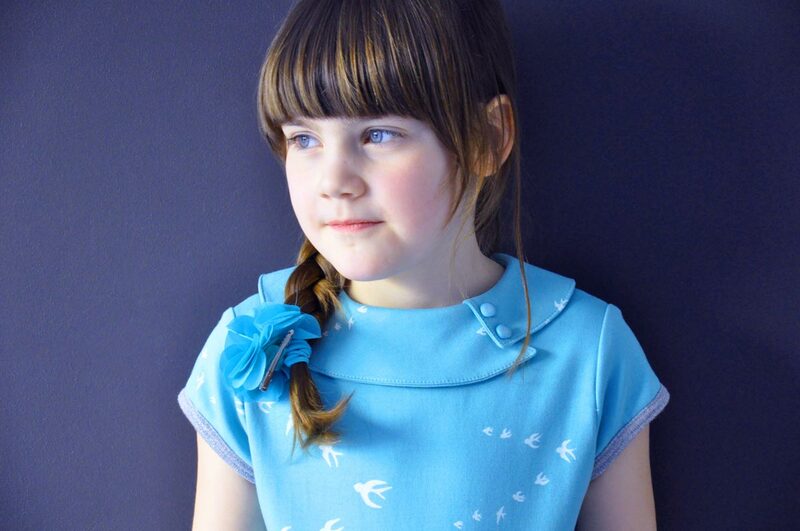 This new pattern pieces is compatible with the Louisa, Lotta and Ileana dress and can be downloaded fro free HERE. I also made a 2nd version for the Julia sweater that I will release soon. Thanks a lot Isabelle for this new idea. I can’t wait to use this new collar myself! Even though I’ve been sewing for a few years, it was a big step for me to enter the unknown blog-land. Luckily I got a few helping hands, some taps on the back and I dived into it… In other words, I’m a rookie in the world of blogging. 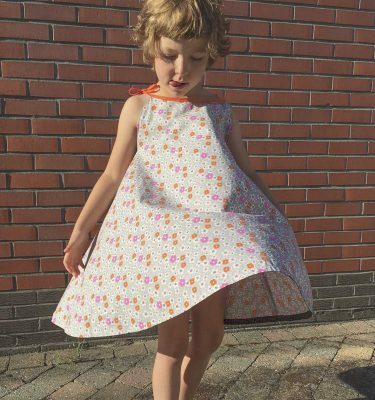 When Marte of Compagnie M. approached me to blog about her patterns, I didn’t hesitate. She organised a contributors event together with some other talented bloggers. After sewing a few trials and errors I managed to end up with the right one. A collar with a vintage twist. 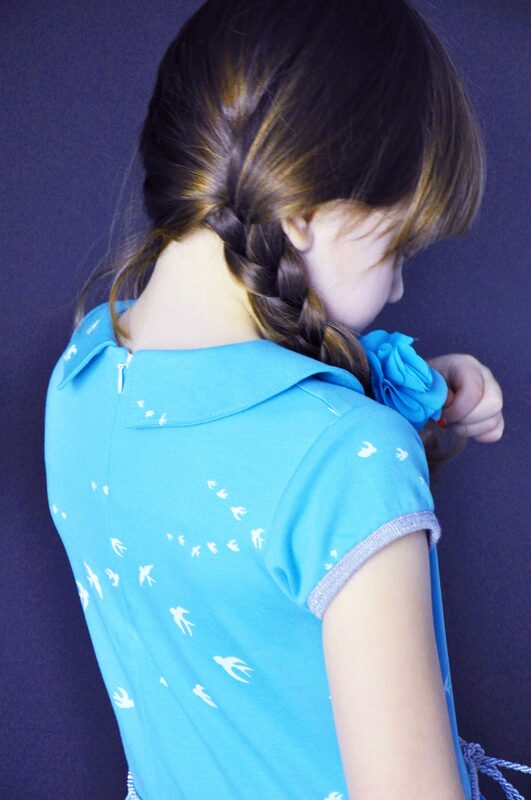 I adapted the pattern with this collar and added short sleeves. The dress is made in a heavier jersey instead of cotton. A perfect match for this pattern. The complete tutorial on the modifications can be found on my blog. I also added loops to hold a belt or string. The skirt part has not been changed, I only added some piping to the pockets. The back is finished with a blind zipper. You can finish the collar in several ways. You could also add piping. On this one I added matching vintage buttons. The pockets and sleeve bindings are made out of glitter sweater. Those match nicely with the blue colour of the jersey. I found a silver cord used for curtains to serve as a belt. I fell instantly in love with this soft fabric. The heavy double gauze jersey suits my girl perfectly. I wanted the collar to be an eyecatcher, so I also made a matching Julia sweater. That way you can combine the two pieces and also wear it in winter time. For more info on the sweater and a tutorial hop over to my blog. 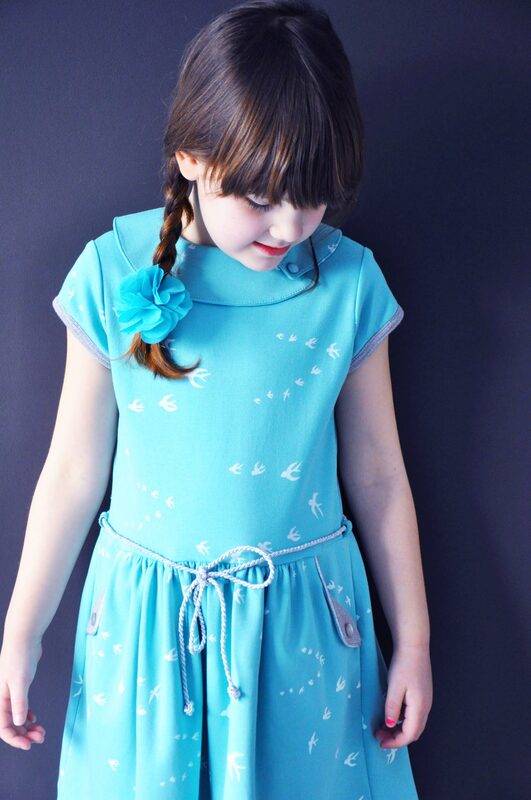 Pattern : Lotta dress and Julia sweater by Compagnie M.
Fabric : Birch Flight Aqua and grey glitter sweater. Decorations : Stoffen Van Leuven and Mertens. Voor dat leuke kraagje een dikke 10 Isabelle! Dat wordt zeker een topper voor menig zelfgemaakt communiekleedje de komende weken/maanden!! Dat heeft ze mooi ontworpen hé! Ik wil het graag ook eens proberen! Wauw, ik sta helemaal perplex! Dit is gewoon prachtig! Super leuk die nieuwe kraag! 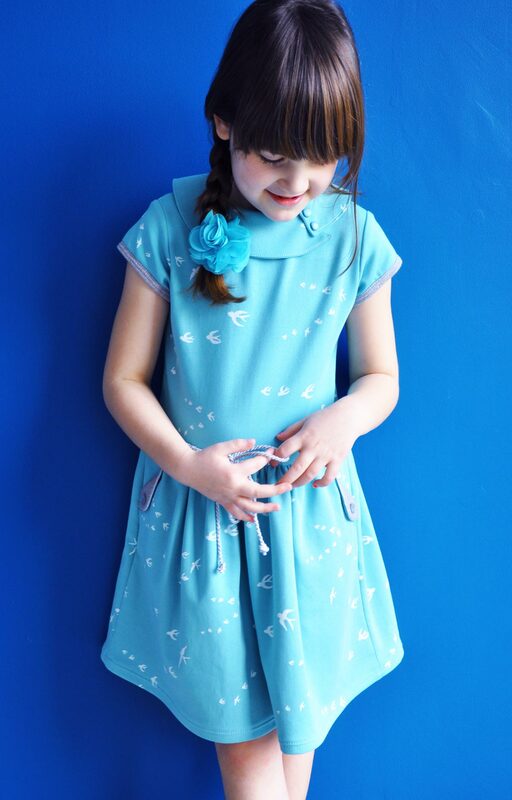 What a stunning dress Isabelle! Absolutely beautiful and gorgeous pictures!! So very nice!! If only I had a girl…..
I’m moving to Belgium. There’s something in the water that fuels amazing sewists there! Helemaal mee eens. Isabelle heeft talent!